This is Julianna, a contributor for Simple Acres visiting again. 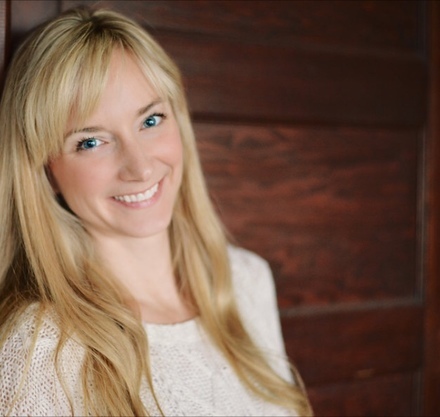 I am passionate about living a life full of purpose and intention while sharing ways to SIMPLIFY life! Do you ever feel like your schedule needs some decluttering? Are you overwhelmed and worn out? 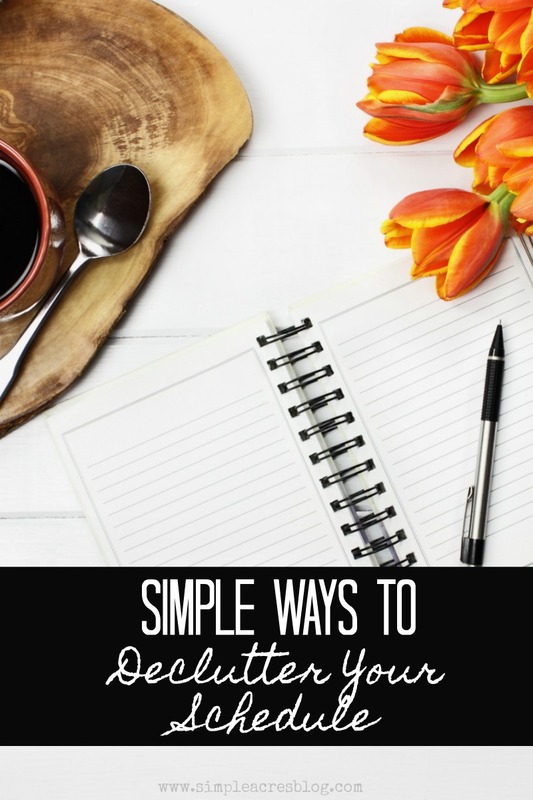 Let’s take a look at how to stop over scheduling and make room for margin in our lives.There are simple ways to declutter your schedule...let’s learn more! There are 5 areas that can be a challenge when it comes to our schedules. We multitask and wonder why we keep forgetting things or aren’t getting as much accomplished as we’d planned. It turns out, multitasking isn’t actually effective. It is a myth to think we can do multiple things well simultaneously. Our brains aren’t meant to handle doing various tasks at once. Singular focus is required for achieving optimal results. As women, we feel like we need to multitask often. Children always seem to be asking for or needing something from us. There are instances though where we are multitasking because we are overcommitted. Most of us are overscheduled. We are doing too many things and running ragged because of it. Our culture values and idealizes busy. Social media reinforces our desire to not miss out on all the things. When we say yes to too many things, we are forcing ourselves to try and balance various roles at the same time. Once we’ve overcommitted we are likely to feel burned out, depleted, and sometimes even bitter or resentful for all that we are expected to do. We also aren’t able to do our best work when we are spread too thin. It’s easy for things to slip through the cracks when there is so much going on. When we feel overwhelmed and like life is out of balance, it’s time to reassess priorities. First, examine your values and priorities. Do you know what your why is? Is your current schedule reflecting your why and your goals? If it isn’t, it’s time to reassess your commitments. It’s easy to say something is a priority, but if something is important it should be reflected in your schedule. For example, I can say family time is important, but if our schedule shows every person the family doing separate activities constantly, then our schedule isn’t reflecting our values. We overcommit because we have skewed ideas about what is expected of us. People pleasers have a difficult time saying no. We can feel guilty or think we need to do things that we actually don’t. In order to regain control of our lives and our schedules, we need to practice saying no. The goal is for your life to be in alignment with your why. See where you may need to cut back to create more space in your life. When you are clear on your priorities, it allows for a new sense of focus. It becomes more readily apparent what is a yes or a no when you’re faced with new opportunities. Does it fit with your priorities and values in your current life season? If it doesn’t, then the answer is a clear no. If it is aligned with your priorities and you have the capacity for it, then your yes becomes easier. How we spend our time determines how we spend our lives. Don’t live a default life filled with things you never intended. 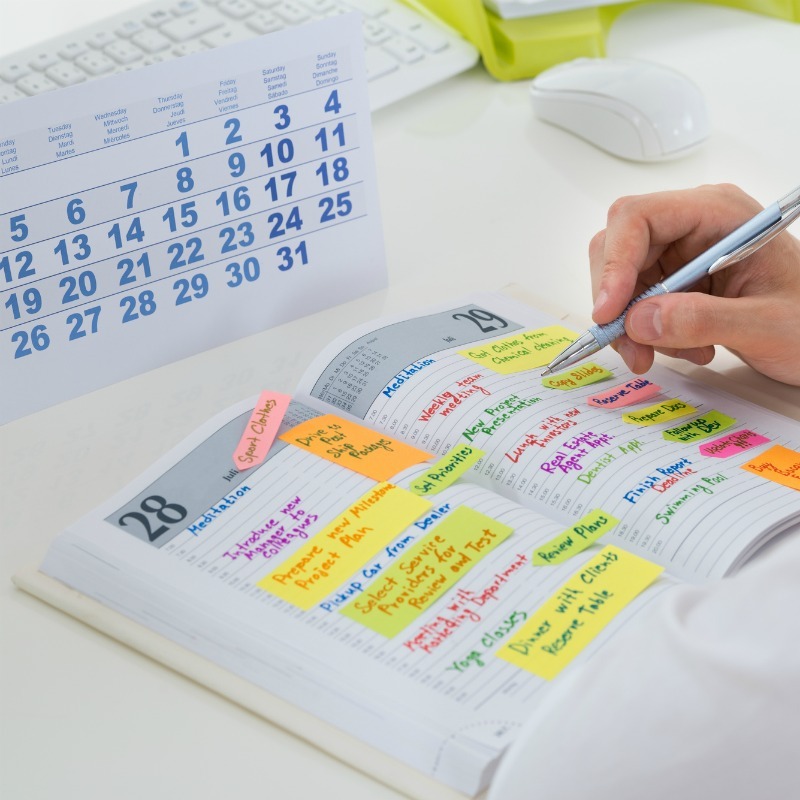 Decluttering your schedule is an important part of living a life of purpose and intention. Our culture doesn’t place a high value on rest or margin. While the concept of self-care has become more popular, it often thought of as an additional action item rather than rest or intentionally planning nothing. If we don’t plan for margin, it is easy to fill in all the gaps on the calendar. When we do that, we lose the ability to say yes when something unexpected comes up. We may miss out on opportunities because we are already overcommitted. It’s also in the margins that we get to enjoy an impromptu dance party with our kids or get the opportunity to talk with them about challenges they may be having at school. Planning margin in their lives is healthy for them too. Play, rest, and even boredom are actually good for us! Looking for ways to create more margin? From February 7-11, fill out the form on my affiliate link and you can get a FREE e-book called Make More Margin with over 75 tips on finding more time in your day!